Two Wrongs making Two Rights. THE NEGOTIATOR would have scored higher Cukee ratings had it not opted for melodramatic Hollywood-speak and Samuel L. Jackson‘s penchant for delivering didactic lines as if he was Jules in PULP FICTION explaining stuff to Vincent Vega. Jackson is police hostage negotiator Danny Roman – the best at what he does – who is framed by what he believes are crooked Internal Affairs officers, so takes them hostage to prove his innocence. Danny’s compatriots are at a loss on how to “talk him down” (when they decide on someone to “negotiate” with Danny, it is not the stable David Morse or the icy captain; to comply with dramatic comedy protocol, it is the jumpiest guy in the room), until Danny himself requests the services of another hostage negotiator who is also The Best At What He Does, Chris Sabian (Kevin Spacey). Isn’t it obvious by now that “crooked Internal Affairs officers” is tautologous? You can take it for granted in movies that if a cop accuses Internal Affairs of being corrupt – they are. So though red herrings and minor twists abound, it is quite obvious that Danny’s main hostage, the IA guy Niebaum (played by a sneering J.T. Walsh), is, in fact, corrupt. In one of those cringeworthy didactic scenes, Danny describes to Neibaum how a person’s eyes give them away by looking up and left towards the visual cortex when they are lying. Now why explain that to an intelligent criminal you are trying to get the truth out of? Then he backpedals for us audience, “It’s not just the eyes, it’s a thousand things!” Dare we ask for more didactic explanation? 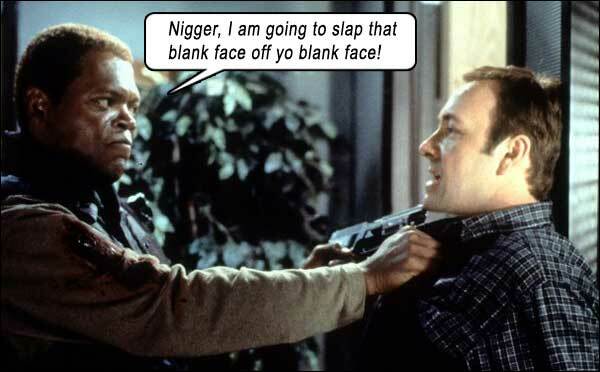 Kevin Spacey puts that dead speaking delivery of his to good use as negotiator Sabian, but even he is seduced by the dulcet over-explanations of Jules describing why he’s as innocent as a foot massage to Marcellus Wallace’s wife. So we end up with TWO hostage negotiators against the police. And all sensible talking breaks loose. Action, deception, counter-deception, gunshots, explosions, Paul Giamatti as a jumpy computer hacker hostage, David Morse as an ice-cool cop; THE NEGOTIATOR is well-produced and intriguing, but resorts to dumb dialog and pat action more than it needs to with such a compelling storyline as its base. It is not implausible that this situation might occur in real life – a cop’s partner is killed and he is framed by other cops for the murder – but I find it impossible to believe that the framed cop would stoop to hostage-taking to prove a point. Even if Internal Affairs is hellbent on incarcerating him, the cops in Danny’s department would have legally wangled their way out of having Danny spend any jail time. Did he really have to overact this much to prove a point? Writers: James DeMonaco, Kevin Fox. Starring: Samuel L. Jackson, Kevin Spacey, David Morse, Ron Rifkin, John Spencer, J.T. Walsh, Siobhan Fallon, Paul Giamatti, Regina Taylor, Michael Cudlitz, Carlos Gómez, Dean Norris, Nestor Serrano.